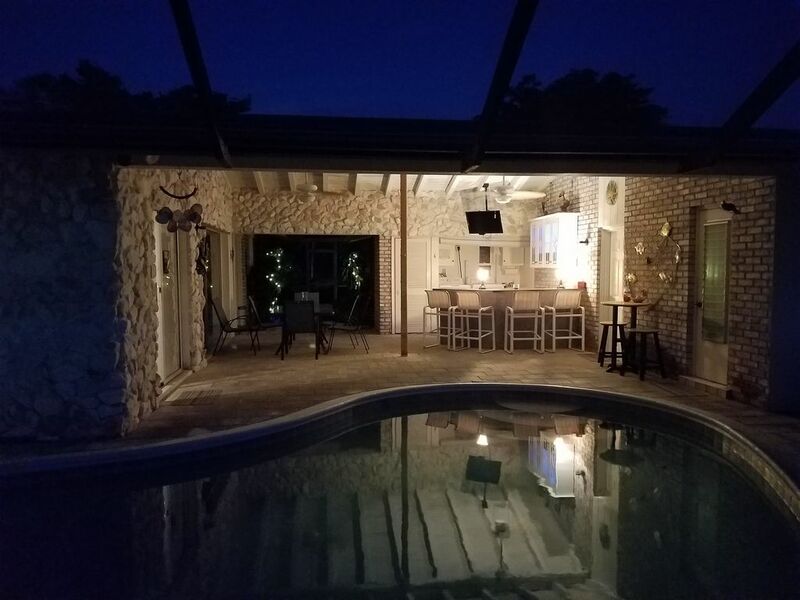 Waterfront 4 BR, 3 Bath Pool Villa w/Gulf Access & Guest House! Other amenities: Every bedroom has a flat screen tv with built in DVD player. The baja room and living room both have smart TVs hooked up to the wifi. There are fishing poles, bicycles, pool toys, beach chairs, a portable crib, stroller, high chair and children's toys available to our guests. Boats can be rented locally. For those cool nights, the fire pit on the patio can provide some warmth and ambiance. Pool & yard are serviced bi-weekly. We are from NJ but enjoy the warmth of the people and weather in Cape Coral as much as possible. We visited Cape Coral at the recommendation of friends and were delighted with its layout and location. There are so many great restaurants and watching the sunset from the yacht club deck is totally relaxing, especially when local talent serenade you. This property was so distinctly unique compared to others we looked at. With it's fishpond and footbridge inside the lanai and the separate guest house, we felt it would be a great place for travelers to stretch out and relax. It is perfect for large crowds and entertaining. We spent a lot of time redoing and expanding the tropical gardens that surround the house and created many places to sit and take in the ambience. It is always possible to find a quiet spot to be alone if the mood strikes you. The shops and restaurants are within walking or biking distance and the neighbors are fantastic. Bathrooms are not wheelchair accessible however pool bath and master bath have low step into showers. Enjoy watching fish jump, dolphins play and manatees float along the peaceful San Carlos Canal and park your boat at the dock. Central air in main house. Wall unit in guest house. wifi - surf the net from the lanai! Table has built-in leaf that extends table to seat 8; extra folding chairs are provided; breakfast bar seats 3. Games for all age groups in Baja room and table games can be found in lanai bar cabinets. There are a few CDs and a CD player. Toddler toys, pool toys and adult bicycles. Rentals available from local businesses. 9 regular and 1 tandem bicycle available for guest use. Rentals available from local businesses; Information is provided to guests before they arrive. Wheelchair can access lanai, main house and guest house. Depending on size of wheelchair, navigating hall to bedrooms may be difficult. 9 foot deep; heated, some toys and floats provided; cleaned bi-weekly. Pool is 9 ft deep at deep end & heated. Smoking is permitted outside & ashtrays are provided. There is a small beach at the yacht club & Ft. Myers beaches are only 20 minutes away. SunSplash waterpark is even closer. Captiva, Sanibel & Pine islands are 30 minutes away. Naples is 1 hr. & Tampa is 2 hrs away. The food, dollar and liquor store is a 5 minute walk. There is inexpensive bus transportation that runs throughout Lee County. We had an awesome time staying at Toni's place for spring break week! Our family of 5 were more than comfortable. Our parents came to visit and there was plenty of room in the mother-in-law suite. The house was in excellent condition and the pool was clean and warm. Toni was prompt in all her responses to our questions regarding amenities and check in procedures. The house had everything we needed from beach towels down to the spices we needed for cooking. The location of the house was a block away from the downtown district and there was plenty of grocery stores, restaurants and shopping within a 5 minute drive. We rented a boat from capecoralboatrentals for a reasonable price for the week and were able to store it on the lift at the house. The canal was packed with tons of wildlife from fish to manatees and dolphins. You can reach the beaches of Sanibel, Captiva and Fort Myers in under an hour on the water and we did this daily as driving during spring break was a bit congested. The house has a bunch of bikes in the garage and we took a bike ride around the neighborhood. 3 block away from the house we found a neat little preserve with some burrowing owls! The kids really enjoyed them. Awesome week and thank for your hospitality! Loved the Location and the House! We had a fabulous time and really enjoyed our stay. Great vacation home for a large group! We recently stayed at Toni’s VRBO home in Cape Coral. It had plenty of room for our group of 8 adults and 3 small children. The pool was a real hit for the kids and adults. Our 6 year old granddaughter said “it was the best day of her whole life”. There were several places in the house for groups of people to gather plus the lanai allowed us to be outside when the weather was cooler rainy. When we had an issue(my fault) Toni was ver quick returning my call and solving the problem. Should we return to Cape Coral we would rent from Toni again. Overall this was a good experience. The house was very nice, especially enjoyable was the sun room and one of the nicest lanais and deck area that was well supplied with lounge chairs that we ever had. The house was well equipped with dishes, cups, glassware, pot & pans, utensils, towels, etc. Unexpected was the generous supply of cleaning supplies and paper products. Also the house has a TV in every place possible. The bathrooms are a little small and no bars in the showers. Also the pool was very nice and would be a lot nicer if it had hand rails to get in and out (speaking as a senior). Best of all was dealing with Toni, she always responded very quickly to any questions that we posed. I would recommend this property to friends. Beaches, shopping, restaurants galore! Lots to do & lots to see. Visit Fleamasters Flea Market. Walk the promenade at Ft. Myers beach. Search for shells on Sanibel Island. Get wet at SunSplash water park. Bicycle the many bike paths in Cape Coral. Fish off the dock or take a boat trip. Rent your own boat & explore the canals or travel down the San Carlos Canal to the Caloosahatchee River & set anchor on one of the numerous islands. >Rate discounts apply for reservations of 21 or more nights. >Monthly rates apply to 28 night stays. >$300 damage/electric deposit for weekly rentals & $500 damage/electric deposit for monthly rentals. >Rates are subject to change until reservation is confirmed. >$5/day electric allowance after which overage will be deducted from deposit. >Reservations are not confirmed until deposit is made.